Previously, on MinerBumping... 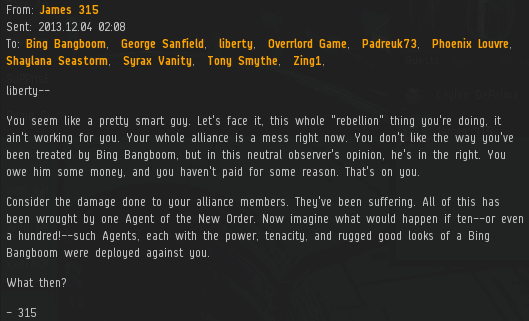 Agent Bing Bangboom launched a righteous one-man wardec against the bot-aspirant U.S.A.T.O alliance. They were forced to retreat from highsec into a wormhole, where Bing followed them and blew up all their stuff. I had to believe that a peace could be salvaged from the ashes of the U.S.A.T.O's wormhole hideaway. I contacted the alliance's leader, the misleadingly-named liberty, and offered my services as an impartial mediator. liberty found the idea provocative and sent me a lengthy reply. liberty started the way so many other highsec carebears do, using the ol' "I wasn't AFK, I was just..." excuse. In this instance, it was more than a moment or two of going AFK. The U.S.A.T.O POS had gone unfueled long enough for its shields to power down and give Bing the chance to destroy its contents. In her first, run-on sentence, liberty says "we're still hear and will continue to be here." If you find her spelling to be offensive so far... Brace yourself. liberty hadn't yet gotten to the part where she addressed my offer to conduct mediation. She found it more important to express her belief that highsec miners should be completely safe so CCP can get more customers. I've often claimed that this is what carebears believe. liberty is just more evidence. Like the Batman, I have become a legend, a symbol that strikes fear into the hearts of criminals. liberty had never "hurd speak" before. At least now she had a story to tell her grandchildren. If they could understand her, that is. liberty concluded by railing against Bing Bangboom and his vendetta against her alliance. It seemed as though she didn't want me to serve as a mediator. As any mediator will tell you, it's important to manage the expectations of each party. You need to point out their weaknesses and remind them of the dangers of not coming to an agreement with the other side. In this case, liberty risked having her alliance remain paralyzed--all for the sake of her stubborn pride. liberty replied again. She recognized the economic cost of not surrendering. But she argued that surrender carried its own cost, a moral one. Her alliance existed not for the purpose of mining or making isk. Their motto is: "Protect the ones that are taken advantage of by the likes of those who take advantage of those who cannot defend themselves against the shadows as shadows is all that you are bullying the weak..."
Not quite as snappy as "truth, justice, and the American way." I don't know what it is, but liberty really has a thing for shadows. liberty returned to her list of grievances against Bing Bangboom. By attacking U.S.A.T.O's wormhole assets, he was overstepping his bounds, making things too "personal". (Apparently it's too "personal" to attack those with whom you are at war.) She called this practice of war-making "cyber bullying". 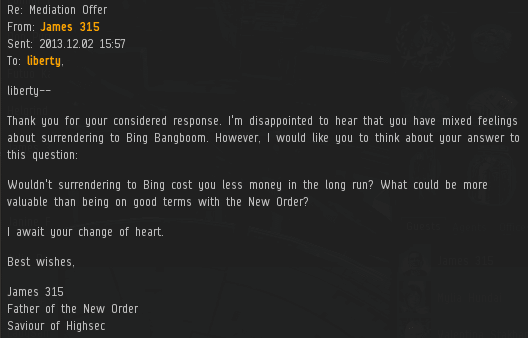 Then she said she found Bing amusing, but a few lines later admitted that she was trying to get CCP to ban him from the game. On occasion, critics accuse me of demonizing highsec miners by portraying an unfair caricature of the carebears. Not so. I merely give them the opportunity to speak. And then they complain about the "tirrony" of my "royal rule". In one last effort, I attempted to make liberty see reason. With U.S.A.T.O on the ropes, there was no telling how bad things could get if she didn't surrender. It's a common misconception that Darth Vader says "Luke, I am your father" (or in liberty's case, "farther"). The actual quote from The Empire Strikes Back is simply, "No. I am your father." With cries of "VeVe La Revolution", liberty vowed her alliance members would "stand shoulder too shoulder" against the New Order. So that was it. 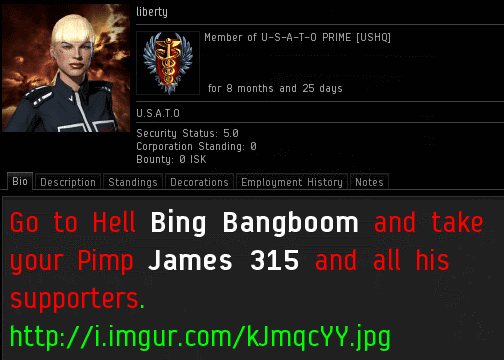 There would be no peace between Bing and the U.S.A.T.O alliance. In the days that followed, liberty's alliance members detached themselves from their neighbors' shoulders so they could run away. Defenseless, liberty was forced to evacuate the wormhole. What would happen next? I direct you to Bing Bangboom's never-ending tale of war on the MinerBumping forum. Although I wasn't able to convince liberty to go to the bargaining table with Bing, I had done my part. Say what you will about the New Order, but we always give peace a chance. I doubt I could have handled any communication with Liberty without asking for the English language of whatever she was trying to say. RIP in peace the entire English language. We need a "Chat Gore" tag for posts like these. A warrant has been put out for the arrest of liberty for grievous harm to the English Language. I seriously hope liberty has put this on her Christmas list this year. You don't characterize miners as bad people?